When it comes to the greatest coaches in the history of the NBA, names like Phil Jackson, Red Auerbach, and Gregg Popovich are brought up quickly, and rightfully so. 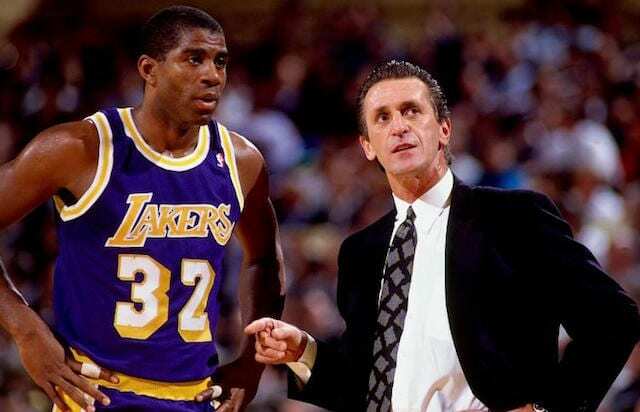 But very few could match the early success that Pat Riley experienced when he took over the Los Angeles Lakers. Taking over 11 games into the 1981-82 season, Riley would lead the team to a championship in his first season. He would go on to win at least 54 games in each of the following eight full seasons he was at the helm in Los Angeles. Along the way he would set some records, including on March 9, 1988. The Lakers defeated the New York Knicks 104-99, giving Riley his 400th career victory. In doing so, Riley became the quickest coach in NBA history to reach the plateau, needing just 540 games. Riley’s success obviously had something to do with the team he came into. Taking over the likes of Magic Johnson and Kareem Abdul-Jabbar certainly gives a coach some great tools to work with. But it was Riley who ushered in the high-paced, flashy style of play known as ‘Showtime’ that fans still know and love today. On this particular night in Lakers history, it was Magic leading the way for Riley, almost notching a triple-double and finishing with 26 points, 14 rebounds and nine assists. James Worthy also had a double-double with 18 points and 11 rebounds, while Byron Scott poured in 22 points. This was Riley’s night in the end, however, as he continued to cement himself as one of the greatest coaches the league had ever seen. He would go on to lead the Lakers to another championship at the end of this season, his fourth, and the fifth for the team in the decade.